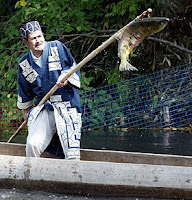 Asir chep nomi ("welcoming the first salmon of the year") is an Ainu festival that takes place each year on the banks of the Toyohira River, a mere ten-minute bicycle ride from where I live in Sapporo. 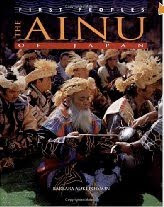 At the core of the festival is a solemn prayer ceremony in which the Ainu elders, in traditional attire, express thanks to the gods for sending the precious gift of salmon. 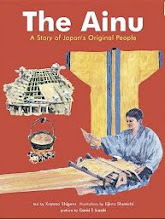 There are also demonstrations of traditional Ainu fishing using spears of ancient design with hinged hooks, opportunities to watch Ainu craftsmen at work, and lots of food cooked in the Ainu manner. After the ceremony there is singing, dancing, and story-telling. Games and contests are also part of the program, making it a very visitor-friendly festival. One of the things I appreciate about this festival is that it gives me a chance to see, hear, smell, touch, and taste things I've only read about in reference books. The Asir chep nomi takes place on a weekend or national holiday in mid-September. This year it was held on Sunday, September 13. 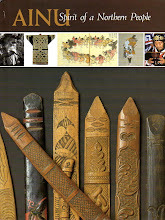 The morew (swirl) and the ayus (having thorns), which were introduced in earlier posts, are the two basic elements of Ainu design that are often embroidered around the edges of clothing to protect the wearer from evil. When combined with each other or with other motifs-- as they usually are-- the patterns grow increasingly complex and intriguing. In the attached photo there is a third motif added to the equation of the first two. This is the diamond-shaped sik (eye). Go back to the original post on morew, and you will now be able to recognize how the ayus and sik motifs have been worked into the morew-based pattern. 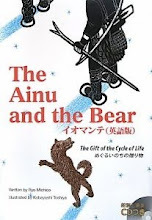 In future posts, I hope to introduce some of the less prominent elements of Ainu design, which enrich the meaning and overall appearance of the decorated item. I will also be shifting the spotlight from "women's work" (embroidery and applique), to "men's work." (carving on wooden utensils). 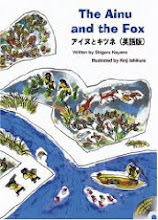 To see the related posts all on one page, type "ainu designs" into the search bar on the right side of this page (near the top). Questions and comments are welcome.